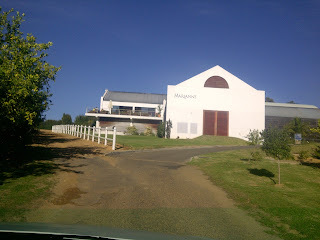 Nice wine, disappointing attitude and service of the tasting room staff. Today we visited Vergelegen as my friend had told me how beautiful it was and that this was the place she wants to get married. Naturally, I wanted to check it out. 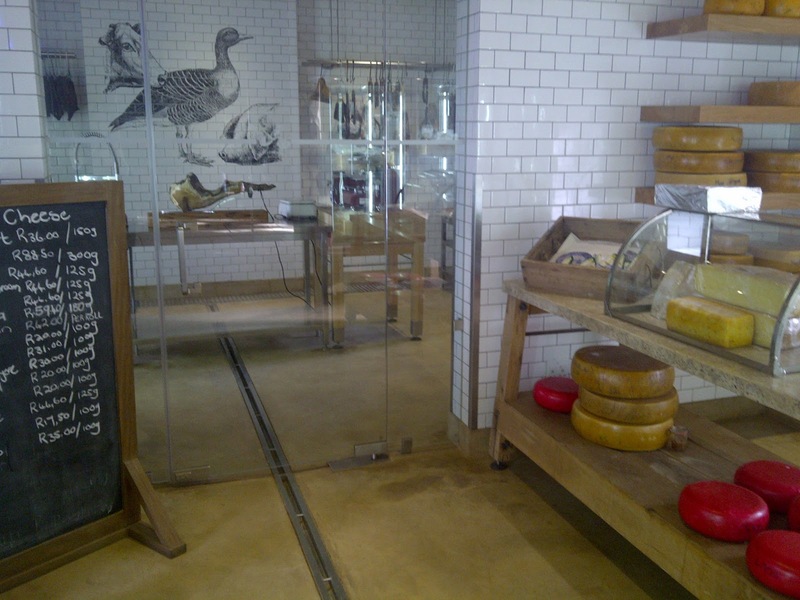 The tasting room is very modern, tidy and spacious. We sat at a nice big oval table with a lovely white upholstery couch. 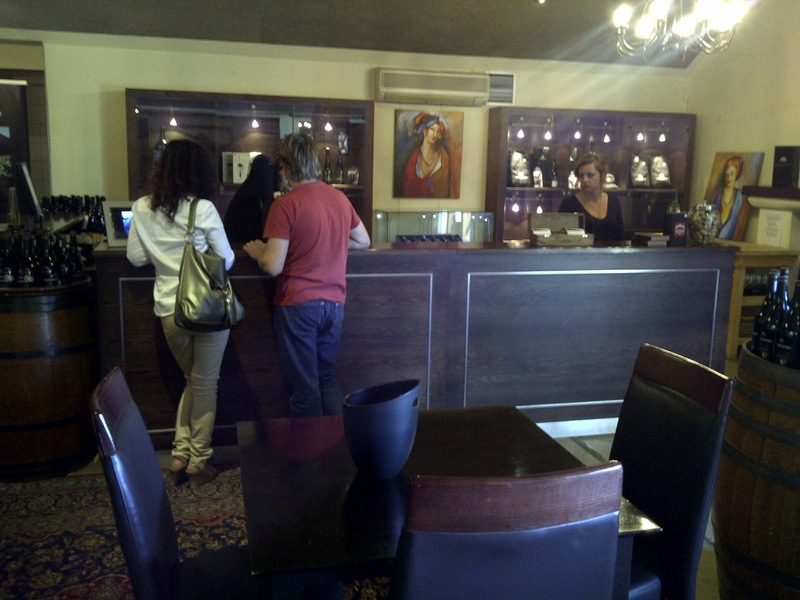 The guy serving us, Handre, explained that it is R30 per person for a tasting of 4 wines. There are 13 wines to choose from. I chose the Sauvignon Blanc 2012 at R85 a bottle, Sauvignon Blanc Reserve 2012 at R170 a bottle, Chardonnay Reserve 2011 at R225 a bottle, and Shriaz Reserve 2007 at R205 a bottle. 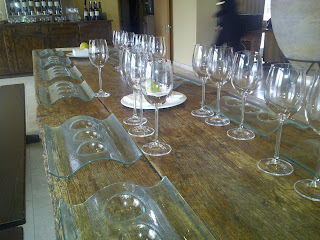 All the wines were brought out at one time in small tasting glasses. Handre asked us if we would like an explanation of the wine and I said yes. He therefore told us about each one and left us to it. The Sauvignon Blanc 2012 had a beautiful tropical nose and taste. It was not too acidic. Beautifully balanced. I really liked it. The SB Reserve 2012 was grassy, with pineapple and melon aromas. It also had lemon tones. Was fuller bodied than the first SB. I felt this was more of a food wine. There is a unique taste to this wine which I couldn't work out. Almost tones of honey, nuts and peach. 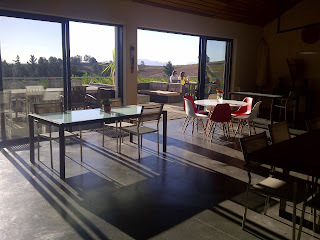 The Chardonnay Reserve 2011 was gorgeous. It had a sweet soft nose. Had an interesting taste. Was complex and nice. It had nutty, vanilla, butterscotch, lemon and citrus flavours on the palate. The Shiraz was smooth with coffee and chocolate aroma, it was fruity and a litte spicy on the palate. Once we had finished the tasting we made our way to the counter to pay our bill. I asked if the fee is waived on purchases and I was informed that it wasn't. I then said in a sarchastic/joking tone, it's amazing how the estate charges R10 per person to come on to the premises and then you still charge R30 without waiving either of these fees on purchases of wine. With that, Handre went very defensive and was pretty rude. His reaction to this comment left us dumbfounded and we felt pretty small. He was so rude and made us feel so unwelcome that you could cut the air with a knife. I almost told him to keep the wine and just charge me for the tasting. I just wanted to get out of there. I was very embaressed. 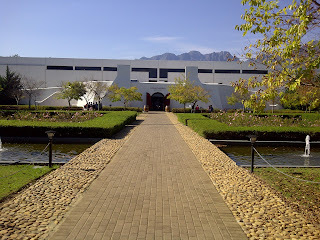 After buying a bottle of the Sauvignon Blanc, we went to the gift shop, and after a few minutes I heard him speaking to some colleagues in the front foyer of the tasting room about the fact I had asked about the fee and couldn't understand why it wasn't waived on purchases etc. I felt it was so unprofessional to have spoken about this while we were still in ear shot. I was embaressed enough with the way he spoke to me and the tone and manner of his voice. To now overhear him speak to colleagues about it just made me so upset and angry. So we left immediately. 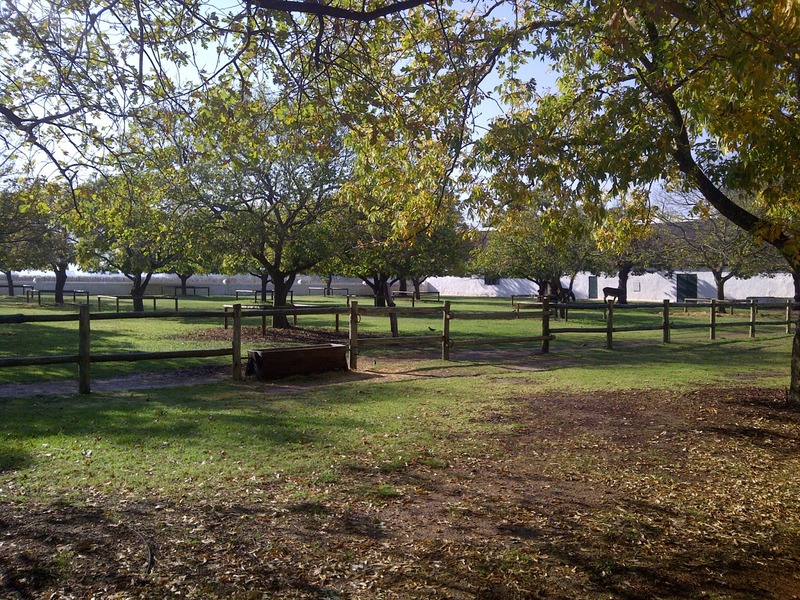 I don't plan on ever going back to this estate because of the way we were spoken to. I personnaly think they have some nerve to charge R10 per person to get on to the estate, then charge R30 pp to taste the wine and not waive at least one of these fees on purchases. I'm not sure how well the tasting room sales are, but personally, if I was in charge of the tasting room, I would refund the R10 on purchases or on tastings. Include it in the price of the tasting or the wine if you have to. 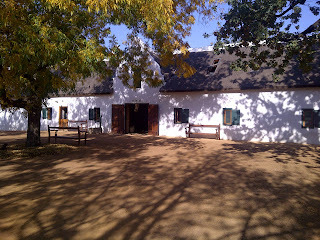 What would encourage one to visit this estate more than once? 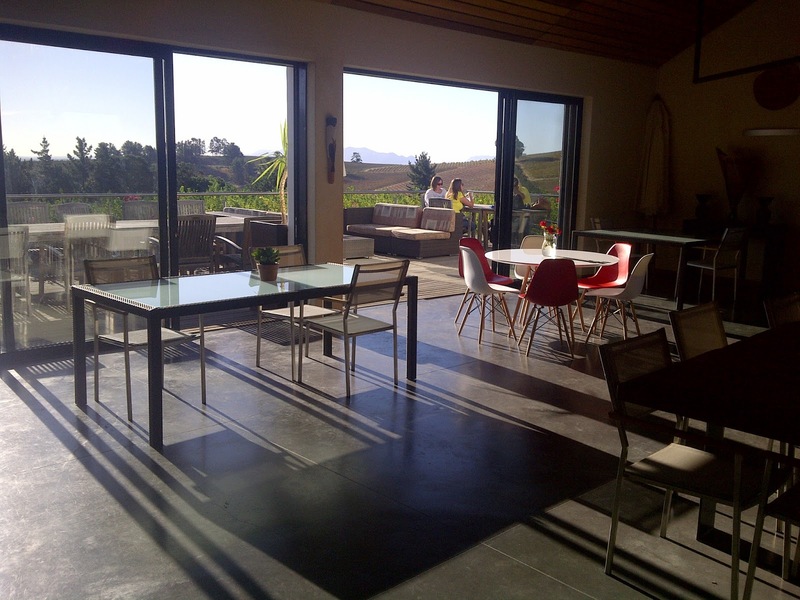 What if you just want to buy wine at the tasting room? 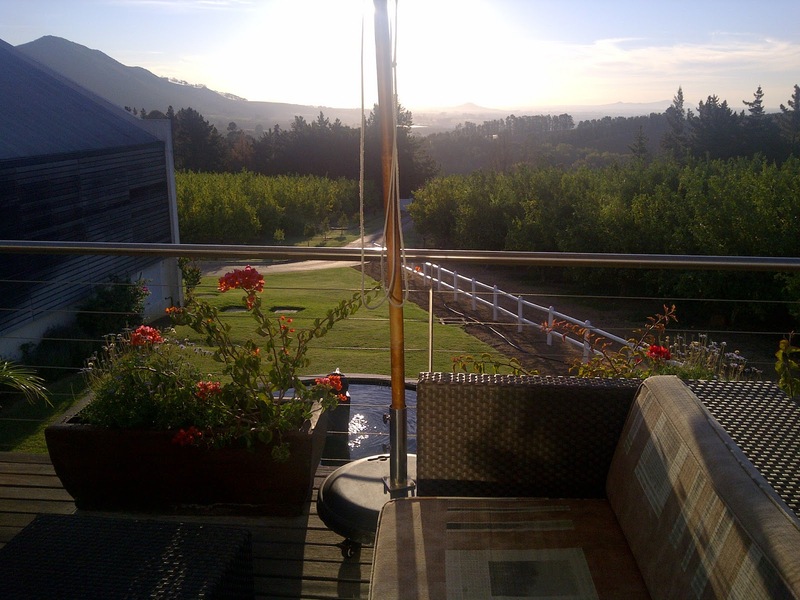 Do you have to pay R10 pp to just go buy wine? I really can't see it being beneficial to the company. Is it basically only those with money that then revisit this estate because they don't mind paying R10 per person each time? Is that the clientele that Vergelegen wants? If that is the case, it is a bit discriminating. Anyway that is my two cents. The person serving us seemed to think he was better than us, and made us feel that way also. I don't quite know where he gets off to treat his guests like that. I will never visit this estate again unless my friend gets married there!!! It was truly a disappointing experience for an estate that has such a prestigous reputation. I don't recommend visiting this estate, but the wine is nice. 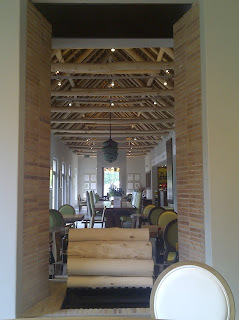 Modern decor, fireplace, indoor and outdoor seating, olive and wine pairing, nice experience. 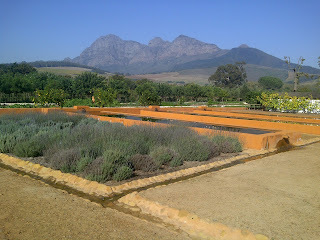 Today we went to Morgenster for an olive and wine tasting. 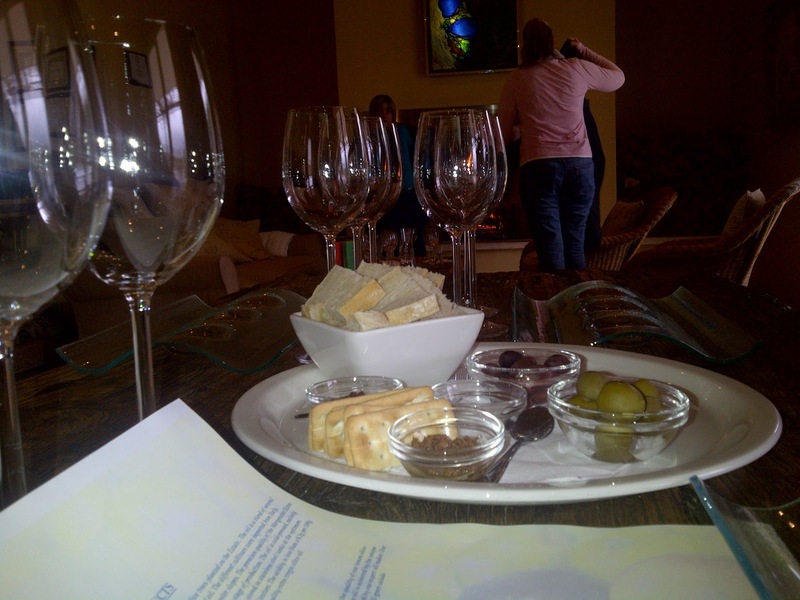 I had been there before for a wine tasting just a few weeks ago and wasn't fussed on the wine, so I wasn't too excited about doing another wine tasting, but I was curious to see how the whole experience would be now that we were doing an olive tasting also. Well the experience was great. If you go to Morgenster make sure you do the olive and wine tasting (rather than just a wine tasting). We sat inside as the weather was not so great. The fireplace was going so it was nice and cosy. 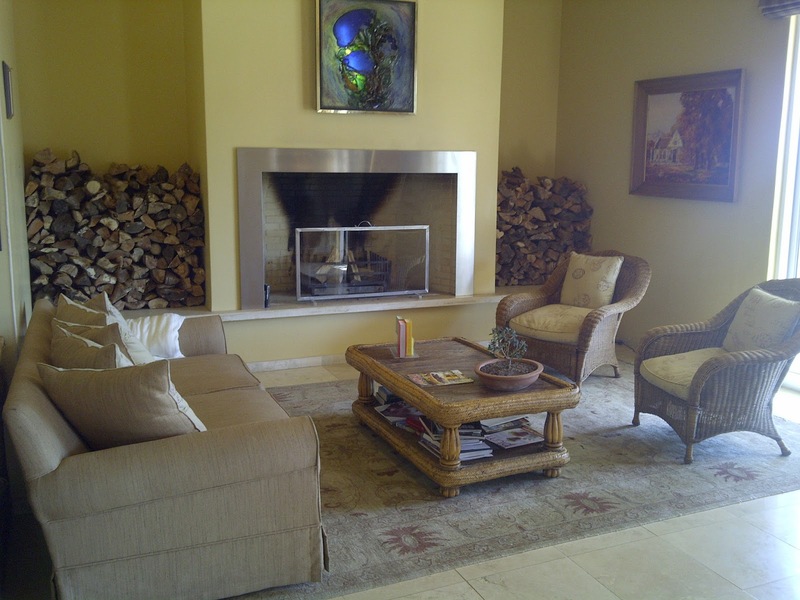 The girl serving us, Keelyn was very friendly, polite, professional and informative. She explained how to taste the oil and how each oil was produced. The olive oil, olive paste and olives were all very nice and it was a lot of fun tasting the platter they had put together. 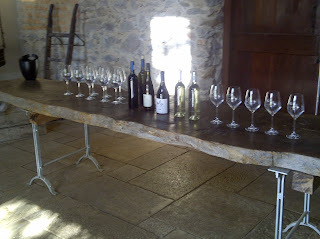 We then did the wine tasting which included 7 wines selected by the estate. First we had the Caruso 2012 Rose at R78 a bottle from the Italian Collection. It is 100% Sangiovese, is off dry and goes nicely with the olives. Having said this the wine enhanced the saltiness of the olives. This wine was light and pleasant. It was nice. Second was the NU Series Merlot 2012 at R75 a bottle. This was a little spicy, had fruity, dark berry flavours and was a little dry. 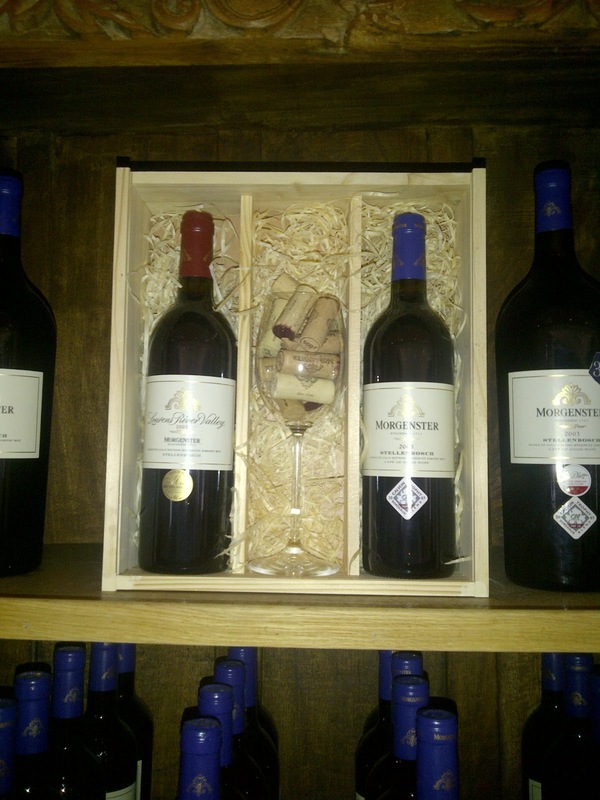 Third we tried the NU Series Cabernet Sauvignon 2012 at R75 a bottle. I liked the colour which was a nice cherry/purple colour. It was soft and a little powdery on the palate. Fourth we tried the Tosca 2010 at R190 a bottle from the Italian Collection. This had a slight brickish red colour, gorgeous nose, smooth, heavier than the Cabernet and a little more serious. It was also a little dry. The fifth wine was the Nabucco 2010 at R190 a bottle also from the Italian Collection. It is 100% Nebbiolo. This wine had a slight green/fynbos smell. It was dry, light, and had a capsicum/pepper smell. The sixth wine we tasted was the 2001 Lourens River Valley at R129 a bottle. This is a Bordeaux blend consisting of 55% Merlot, 40% Cabernet Sauvignon and 5% Cabernet Franc. This wine was nice, it had dark berry aromas and flavour, was fresh, clean and light. I liked it. It was a little dry though. 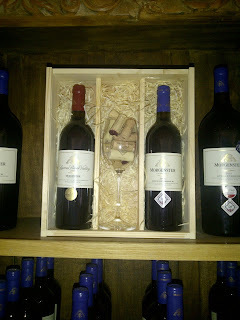 The last wine we tried was the Morgenster (Flagship) 2001 Bordeaux blend at R390 a bottle. 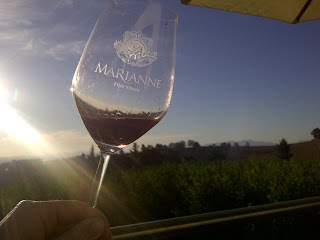 This is a blend of 45% Merlot, 28% Cabernet Sauvignon and 27% Cabernet Franc. This had a slightly sweet port smell, it was a little dry, amd was fruitier then the Lourens River Valley 2001. If you like olives and wine, then I would recommend one visits this estate for this very enjoyable wine and olive tasting. I am still not sold on the wine, but perhaps it is just not my style/choice of wine. Nice place. 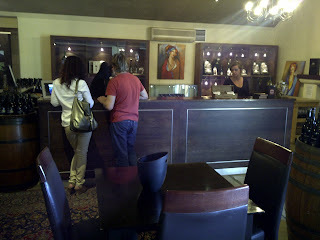 Good selection and quality of wine. Nice setting. Good service. 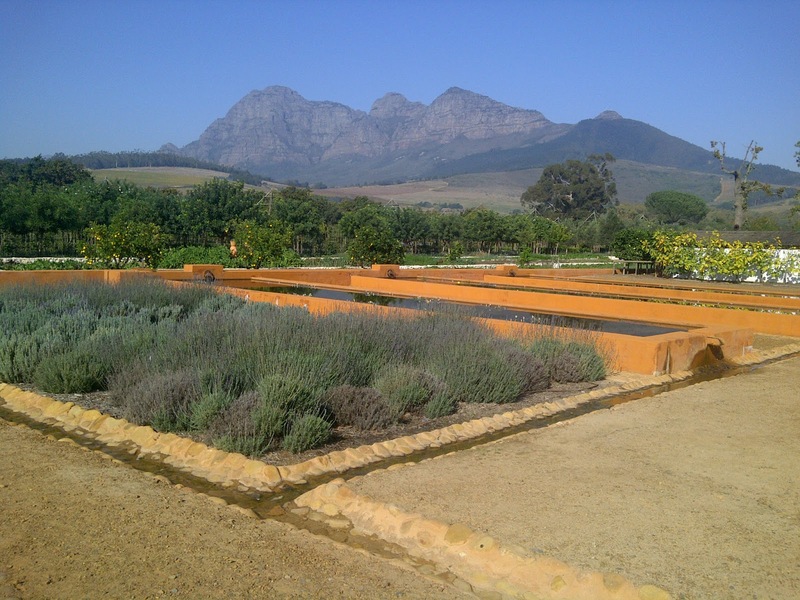 More a commercialised wine estate though. Today my friend and I decided to visit a few wine estates in Somerset West.We started at Morgenster and moved on to Lourensford after that, hoping to have lunch there to finish off our day. At Lourensford you can sit inside or outside. As it was a beautiful day, we chose to sit outside. 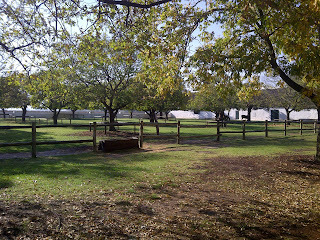 Being a public holiday and all, it was actually quite busy at this estate. 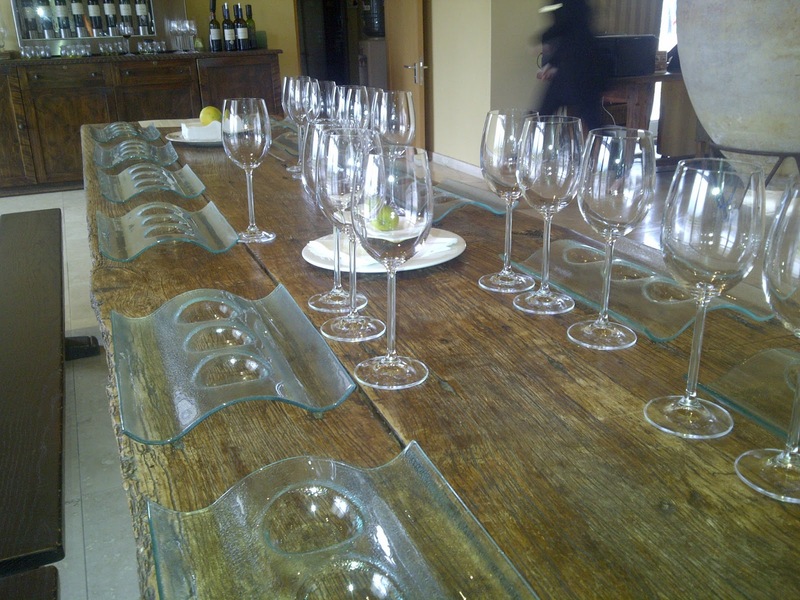 It is R25 per person to try 5 wines, they waive this if you purchase wine. My friend and I ended up trying 9 wines between the two of us. 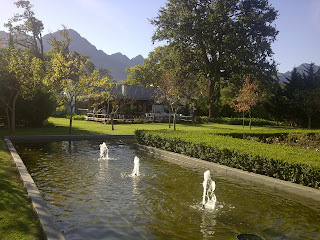 We tried the Lourensford Estate Sauvignon Blanc at R70 a bottle. I liked this, it had lime, apple, pineapple tones, was nice on the nose, light and fresh, a little acidic. A nice tropical SB. 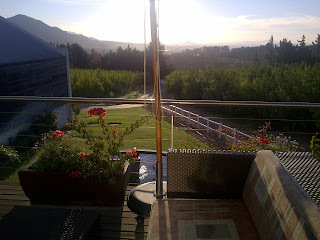 Next we tried the Winemaker's Selection Sauvignon Blanc 2011 at R100 a bottle. We could smell the buttery/oak aromas on the nose, it was fuller bodied than the previous SB, smooth on the palate and had a nice smooth finish, was fruity. Nice. The Winemaker's Selection Viognier 2011 at R100 a bottle was smooth, fruity, had flavours of peach on the palate, lovely sweet aromas on the nose with hints of spicy/stewed apple and cinnamon, nice lingering finish. The White Blend 2009 at R180 a bottle had interesting pepper and capsicum aromas on the nose, a fynbos and pepper taste with asparagus and green notes, it was smooth on the palate. The Shiraz/Mouvedre/Viognier 2011 at R100 a bottle had a lovely smell to it with slight berry, vanilla and chocolate aroma, it was nice on the palate, smooth, pleasant, soft, nice, liked it!! 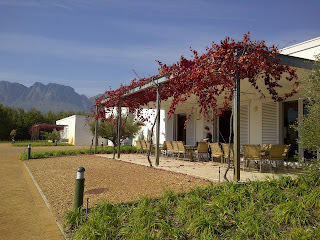 The Syrah 2009 at R150 a bottle was smooth, delicious, bit of tobacco on the nose, loved it. Tones of dark chocolate, a little dry, lighter than the red reserve. Red Reserve 2009 at R300 a bottle was dry, medium bodied, a serious wine, yet smooth, it was fruity. Would be nice with food. I thought this was a lovely wine. I loved it. It was my favourite wine of the entire tasting!! 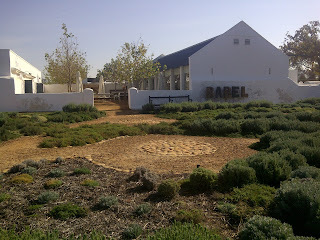 To finish off the tasting, we tried the honey liquor at R100 a bottle and the Noble Late Harvest 2012 at R90 a bottle. The honey liquor is not my cup of tea, it tasted like crystalised honey with water. It was unique, but I wouldn't buy it. The NLH was 100% Semillon, sweet on the nose, a little syrupy, had raisin and honey aromas, was nice but not my favourite dessert wine. 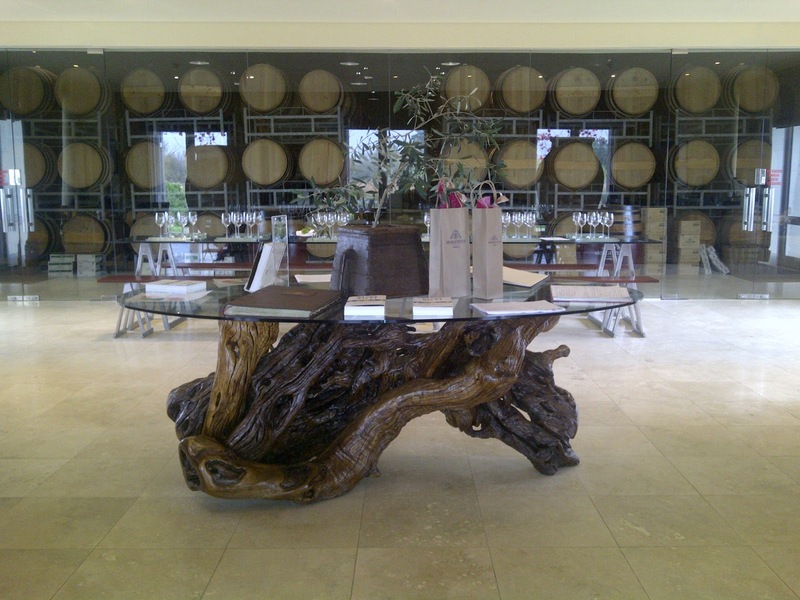 Overall we had a good wine tasting experience here. 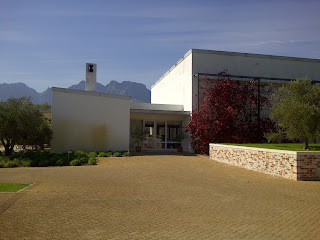 The service by Kenan Tait was good, he brought all the wine out in one go, but gave us a run down on the wine before he left, and was very pleasant and friendly. We went to the restaurant afterwards for lunch. We were very lucky to get a table considering it was a public holiday, so they were very kind to accommodate us with just 30 minutes before the kitchen closed. 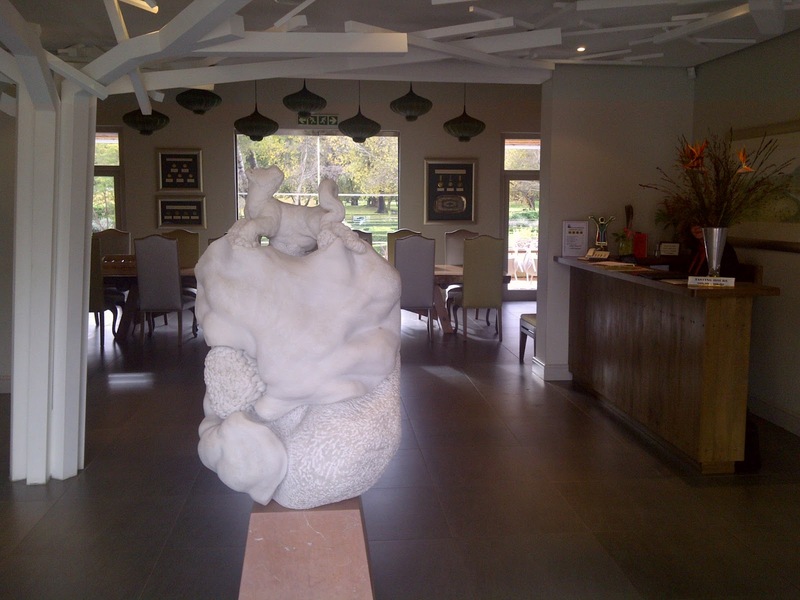 It is a nice restaurant with a welcoming and homely decor. The service is very good and they were very friendly. The menu looked awesome, but sadly our meals were nothing to rave about. The sweet potato chips were awesome though!! I wouldn't go back for the food, but the setting is very nice. 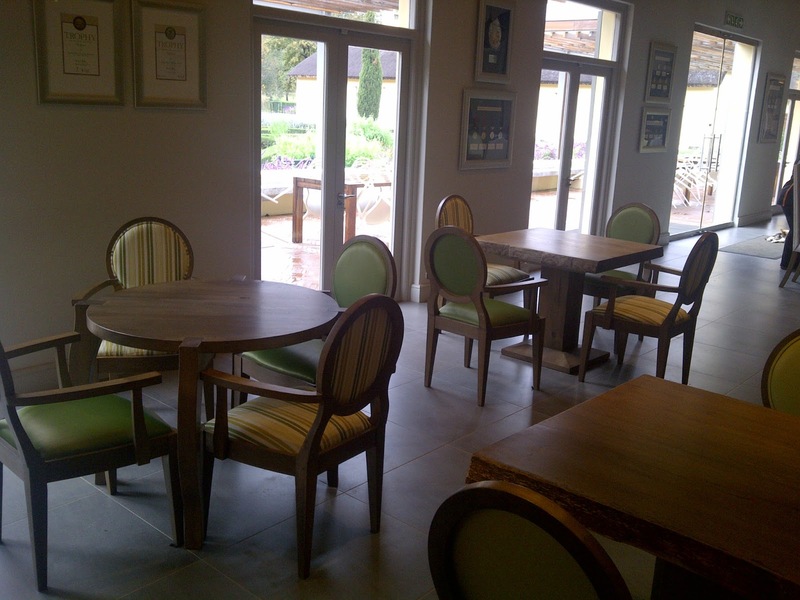 They have an outdoor area out the back where children can play, so its a good place to eat at if you have children. Attractive decor, ok wine, nice setting. 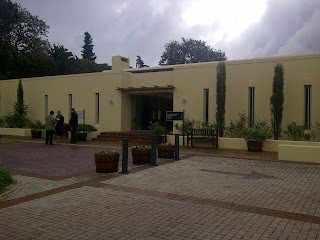 Today my friend and I decided to visit a few wine estates in Somerset West. 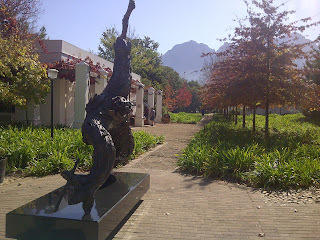 We started at Morgenster as Vergelegen was sadly closed being a public holiday. The decor at Morgenster was very attractive and pleasing on the eye. The service was pleasant and the setting was lovely. 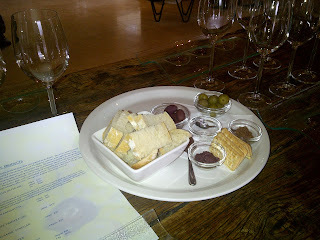 They have cool settings for the wine and olive pairing. 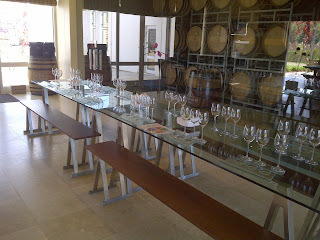 It is obviously quite popular if you look at how many olive tastings they are set up for. At Morgenster you can sit inside at a table, near the fireplace, or outside on the patio. 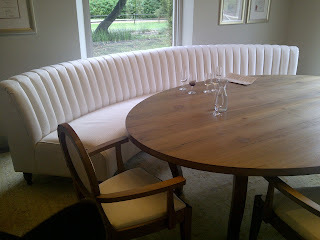 I loved the seating choices; one to suit every style of weather and one's moods. We decided to sit outside seeing as it was such a nice day!! We were given a list of all the wine for tasting; there are heaps (15 wines to choose from)!! What is cool is that they have some older wines for tasting. They also do olive and wine tastings. We chose to just do a wine tasting (without olive pairing). We chose 5 wines which cost R30. They then bring your wine in one go and leave you to taste the wine. 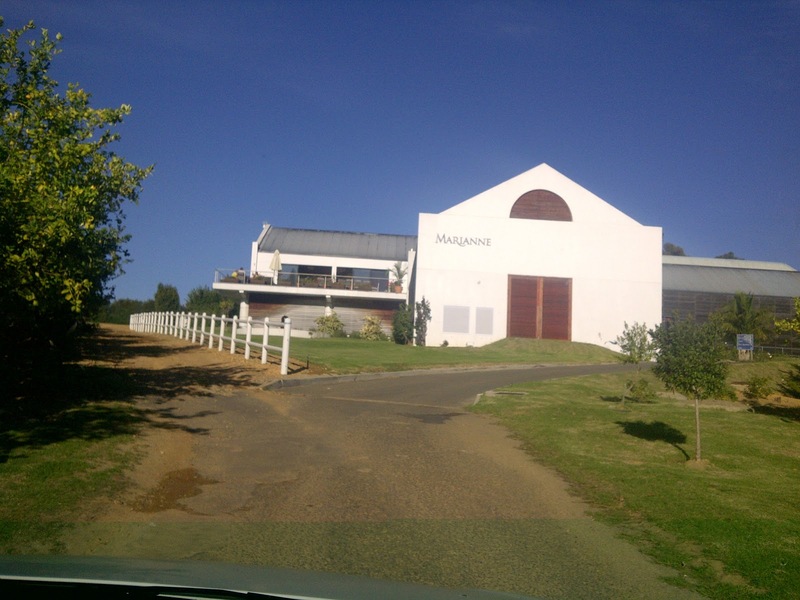 Again, this is fine when you are not so bothered about the winemaking process or are not looking for an experience which involves stories and interaction with the staff. My friend and I shared a few wines, so I ended up trying 7 wines in total. I tried the Caruso 2012 Rose (100% Sangiovese) at R78 a bottle, it had good fruity flavours, was off dry, pleasant, had a tart finish, was smooth, light-med body, had a lingering finish, I liked it. Tosca 2008 (R190) had a slight sweet smell, a bit sharp/burning on the palate, slight mint on the nose. Nabucco 2008 (R290) was lovely on the nose, light, red-brickish colour, tones of spicy fruity flavours, it was nice. Morgenster Bordeaux blend 2003 (R390) had a potent brandy smell with sweet (glazed) cherry and dried apricot tones on the nose, dark brick red in colour, dry, ok on palate, a little nondescript in flavour. Morgenster Bordeaux blend 2001 (R390) smells smoky, is dark brick red in colour, dry, no prominant taste, if try hard enough you might get smoky and light cherry flavours. NU Series Merlot 2012 (R75) was soft, had a dark cherry colour, pleasant, fruity, a little dry, nice on the nose. The NU Series Cabernet Sauvignon 2012 (R75) was sweet on the nose with hints of cinnamon, had soft tannins, was nice and easy drinking. If I had to choose my favourite wines from this tasting, I would say I liked the Caruso Rose 2012, Nabucco 2008 and the NU Series Cabernet Sauvignon the best. To be honest, I wasn't that impressed by the wine overall. 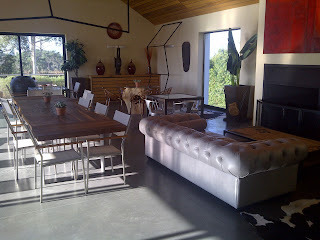 I liked the place though!! 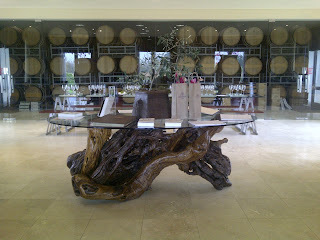 We actually have a voucher to use here for a wine and olive tasting, so I shall go back for that and try some more wine. Maybe I will find a wine that impresses me second time round. Sadly, I wouldn't recommend one goes out of their way to visit this estate, however, if you are out this way visiting Lourensford and Vergelegen, then you might as well visit this place too. 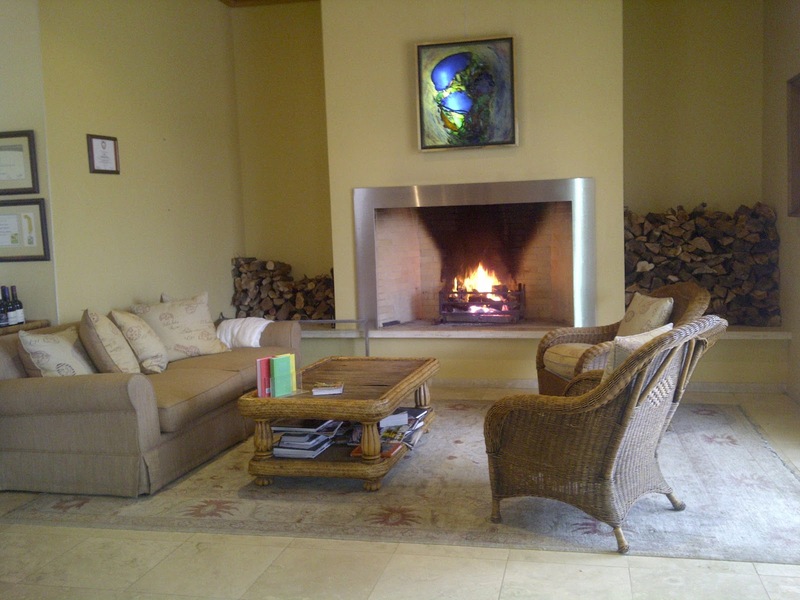 Who knows, you might like their wine and wine tasting experience. 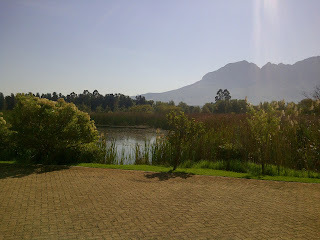 It is a relaxing place with nice views! !